Why is That Ad Following Me Around on the Internet? Forbes has a piece on Why Wall Street Likes LinkedIn More Than Facebook. The difference in how well the two companies monetize user interest is quite significant. And when it comes to making money, LinkedIn packs a much harder punch than Facebook. LinkedIn manages to rake in $1.30 per user hour spent on the site, while Facebook scrapes by with a measly 6.2 cents per user hour. The article’s explanation of this gap is that professional data is more important to enterprises than personal data to consumer advertisers. But I don’t know if it is just about that. Somewhere in there lurks a question begging to be asked? Does Facebook monetize user attention as effectively as it could? Take me. I use Facebook regularly. Not a whole bunch, but I will check in a couple of times a week, mostly over the weekend. Here are the typical ads that I see. I can link each ad back to something in my profile. I live in the Bay Area, am liberal, married and male. 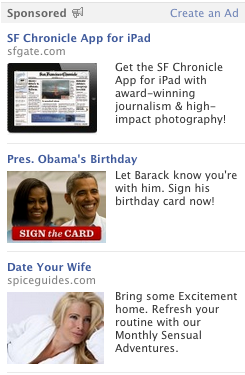 Is this kind of broad-brush targeting the best Facebook can do? The ads are uniformly unmotivating. They are shown repeatedly. As if there was a very limited stock of ads to show and they had to show half a dozen on every page. So sorry, but we will subject you to the same insipid ads over and over again. You might point out that I’m not a typical Facebook user. I share a little but not a whole lot of information. I never use my Facebook login on 3rd party sites. So FB doesn’t have much to work with. But that wouldn’t be true. FB has a ton of personal data for me – my social graph, my status updates. If it still serves up ads that don’t result in any action, is it a wonder that their monetization is at 6.2 cents per user hour? In contrast look at Google advertising. Comparing Google search advertising with FB advertising is perhaps not fair. Search clearly declares intent which makes targeting much easier. Display ads will find it tough to compete with that. But Gmail ads are perhaps as close as it gets contextually, to FB. I find Gmail ads to be very relevant. Google’s algorithms are clearly analyzing my email content to determine which ads to serve up. FB isn’t doing that with status updates. Users want to see ads that are better targeted. I am interested in seeing relevant ads. And advertisers want to reach interested users. The right economic model (a la AdWords) and some clever computer algorithms should get you there. It can’t be that difficult if you have Facebook’s resources. So I wonder why it’s taking them so long to get this right. Twitter too is trying hard to get their advertising model right. Promoted tweets in my timeline show up from time to time. They are using the social graph cleverly and I find many of their promoted tweets relevant. I spend a lot more time on Twitter than I do on FB, so I do hope they find a non-intrusive but successful advertising model. Meanwhile, an ad for a certain watch has been following me around wherever I go on the internet. It so happened that a couple of months ago I clicked on an ad for the watch. I then went and read a whole bunch of reviews and so on and then actually bought the watch. But now, the ad networks think that since I clicked on the watch ad, I am interested in it. So now I am bombarded by the same ad everywhere. All wasted advertising since I’ve already bought the watch. And very annoying. So now I have done two things. Both of them are detrimental to the ad networks’ and the advertiser’s interests. One, I opted out of all interest based advertising. They don’t make it very easy for me to do that, but I patiently went to all the websites and opted out. Two, I will never click on a display ad again. If it interests me, I will google it and get to its website through search. I am positive that I am not the only person who is doing this. Some may want to but don’t know how or don’t have the patience to. But many will opt out. Soon there’ll be a video on YouTube on “How to Stop That Ad Following You Around on the Internet”. And then the game’s over. This entry was posted in Uncategorized and tagged Business, Technology. Bookmark the permalink. 7 Responses to Why is That Ad Following Me Around on the Internet? I feel that “ads” as a concept belong to the old media (newspaper, tv). And targeted ads is a poor extension for it in the new media (search, social networks) – irrespective of Google’s so-called success with it. I have found Gmail ads to be most irrelevant and annoying. Checking my email is not the same as watching TV or reading a newspaper. I am not looking for value from ads when I am checking my email. I am not looking for value from ads when I am checking my email. Google runs a business which gives out free email services in exchange for your attention. Given that they have to run ads, wouldn’t you rather see ads that you find relevant? 90 percent of internet users do not even realise that ads are following them. Till that number comes down, ads will make tonnes of money. I personally don’t have a problem with ads following me around. It’s the Internet’s version of brand advertising. At least it’s something I’ve already shown an interest in.